1. Themed boxes. This was what my husband said was his favorite. For example I did a Cinco de Mayo box, complete with non-alcoholic sangria, Mexican chocolate, and pinata cookies (thanks Pinterest). 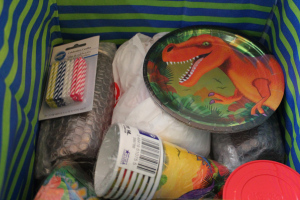 I also sent a Halloween box and Dinosaur birthday box. These were really fun to shop for! The lady at Party City thought I was buying dinosaur party things for a child, not my husband. She was surprised when I said it was for my hubby, but hey things like this are a fun surprise. 2. Games. I asked my hubby what he loved getting, and he said he liked balls to throw around and the like. I always tried to get fun games in the dollar section. It adds some fun to the constant work. 4. Wet Ones/Baby wipes. Seriously you can’t go wrong with sending these, it’s dusty over there! 5. Letters and cards. There is nothing like a handwritten note. We wrote a lot to each other during the deployment. The letters from my husband are something I will always cherish, they are really sweet. I always tried to include a card in the box. I bought some funny cards to send, and wrote others on regular paper. Follow Jessica’s life “in the military” as she chronicles her world of adjustments, deployments, and volunteering on her blog: More Than a Military Spouse. I had a lot of luck buying interesting stuff at World Market. I’m totally obsessed with the store, but they have great packaged foods in their gourmet section (I sent olives and hummus). And have a lot of small items so I made a lot of boxes out of tidbits of this and that. But aside from what to put in the box, there is the sending it. I suggest sending a Flat Rate box from the US Postal Service. They have reduced rates for military packages (to an APO). 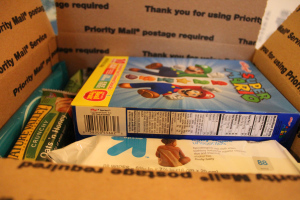 Besides taping up the box and filling it out as usual, you’ll also need to fill out a customs form, CP 72. It’s the larger of the 2 customs forms, I filled out the wrong one on the first package I sent and had to redo it. The deployment address is basically a US address, so don’t fill out country. It’ll be APO AE (zip). APO is the city and AE is the state. You then need to describe what’s in the box, I use general terms like “cookies” or “crackers” and put a random value. Friends of mine often use the same few things, no matter what they send.I have found that different postal workers and offices are a bit pickier. One told me I needed to be more specific (shirts instead of clothes), and rudely at that. And be sure to use clear tape, my friend was sent away from a post office when she had used duct tape. Find the friendly post office, mine asks what type of cookies each time, insisting that they must try, but only their favorite types. It makes me smile every time. So that’s what has worked for me. Since our unit’s stop mail date has passed I’m stocking up on supplies for our friends. Also, check out USPS military mailing guidelines, you can also request mailing kits with boxes, labels, and customs forms. Flat rate boxes, labels, and customs forms are all in the post office lobby, for free. This entry was posted on November 10, 2012 by Robin Avni in cohort 12 reposts + links, of service and tagged creativity, military, package, service, spouse, stereotypes, women.